Don't be in a hurry when you visit. You will miss a lot. The population has held steady at about 1,200 since 1960. 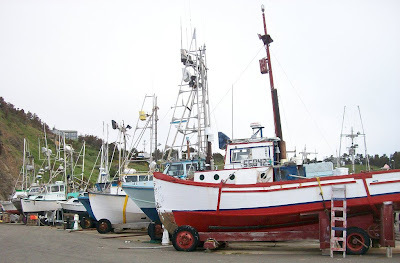 In some ways, a visit to the fishing village of Port Orford is a trip back to simpler times. The lake gets its name from the garrison where the original native inhabitants were imprisoned before being shipped north to the reservation. The Oregon Department of Fish & Wildlife keeps the lake stocked with trout for all you anglers. Impatient tourists zip through town without realizing the lake is even here. Kayaking on Garrison Lake. It doesn't get much better than this. You probably can't see that godawful subdivision from here. The ocean is just over the dune. The glorious gloom is overwhelming(ly beautiful). 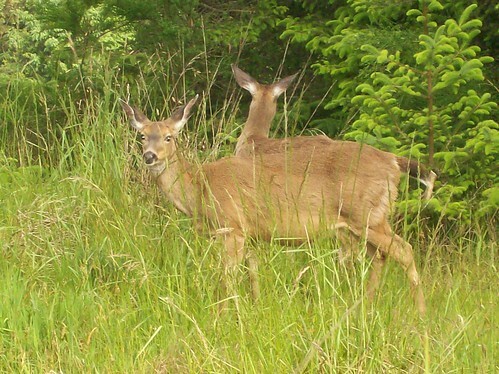 Deer browse freely in the neighborhoods around Garrison Lake. It must be because they have very gentle neighbors. This shot was taken with a simple snapshot camera from a few feet away. Quick bucks didn't materialize for the developer of this ghost subdivision carved from the woods fronting Garrison Lake. Trees were felled to enhance the view. Rumor has it a name was picked out for the dreadful development: The Stumps. I hope a special punishment awaits the perpetrator. The main drag: No traffic lights and a speed limit of 30 mph. My kind of place. Port Orford doesn't have traffic signals. The main drag through town has a speed limit of 30 mph. To most of the civilized world 30 mph is insanely slow. Sure, the main drag through Laguna Beach, California also has a 30 mph limit. No one takes it seriously. Port Orford has squad cars for people like that. It's worth slowing to a crawl for once to admire this unpretentious town. Over the few days I visited Port Orford I found myself wishing it never would have a traffic light. I would love to live in such a place, a place that retains its humanity while the rest of the world cherishes unbridled growth and an ever-quickening pace. 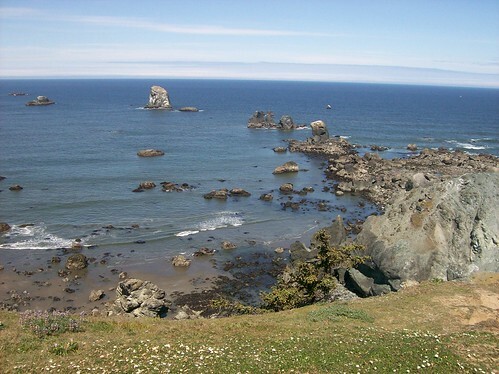 Port Orford is a place where you can slow down and enjoy life. People here actually step outside to take calls on their cell phones. A mysterious drifter shows his gratitude for the kindly treatment he received from Port Orford citizenry. Photo courtesy Valerie Kramer, Port Orford Today. Click on picture to view larger image on Flickr. "There's a new mural in Port Orford and it has been painted on the west facing wall of the Port and Starboard Restaurant. The story all began when an itinerant sign painter and artist named Dimitri stopped in at the Port and Starboard one night around 11 p.m. tired and hungry. He had walked down from Bandon and was on his way to San Diego. The restaurant part of the business was closed but the bar was opened and Dimitri asked for something to eat though he didn't have enough money to pay for a meal. Manager David Smith told Dimitri it would be an honor to make him a sandwich and feed him while a customer offered to buy him a beer. "Dimitri found a place to stay across the street at the Madrona 101 RV Park thanks to owner Michael Dodson. It turned out that Dimitri is an artist and itinerant sign painter and next thing up he painted a beautiful nautical themed mural on the Highway 101 facing wall of the Port and Starboard. It features a dolphin, whale, an old sea Captain, a mermaid, a lighthouse and dunes with strange creatures on them. 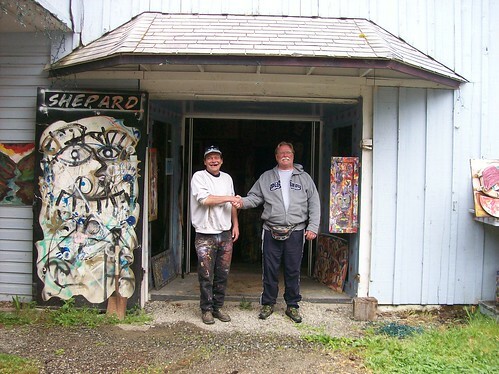 Dimitri had other offers to paint other murals in Port Orford. But once he completed the one for the restaurant he moved on with other goals in mind leaving behind this town a little more colorful. "Bless you too Dimitri and isn't this a good lesson that what goes around comes around." This is a perfect Port Orford story. If you spend some time there it's easy to believe people would be that friendly. The mural is the kind of spontaneous fun that can happen in a small town. No permits had to be obtained, no hearings held. They just did it. The weekly Port Orford Today is a good way to catch up on all PO doings. Every issue is archived online. The view from his living room is spectacular. Java John's is the must-visit place in Port Orford if you can get there around the 7 a.m. opening and hang out with various fishermen, artists, poets, and assorted iconoclasts. Java John himself is your gracious host. As you depart, he will always thank you and wish you a great day. The cafe has a relaxing living-room atmosphere. This living room has a fabulous view of the scenic wonders of Port Orford's Battle Rock, the surrounding forested hillsides and the beach with waves gently massaging the shore. 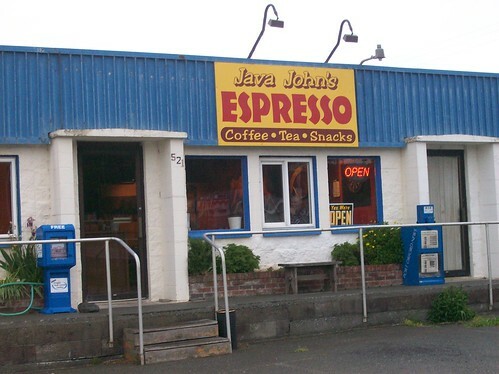 Java John's offers a Starbucks-like array of coffees and novelty drinks to please diverse tastes. The cafe is easily the friendliest and most entertaining hangout in town. John will show you how to read the tide tables, a subject of great interest in these parts. Here's a tip. If you're out for breakfast, get coffee at Java John's first. All of the breakfast spots in town serve lousy coffee. By that I mean a weak, tasteless brew that's essentially decaf. Only Port & Starboard has decent coffee that they grind on the spot. But you can't top Java John's. Battle Rock Park, just outside Java John's. Yeah, it's gloomy. That's what it's all about. John says he's barely scraping by. That's not because of any evident shortcoming on his part. He treats customers with genuine care and concern. You can see the pride he has put into his comfy shop. The soft-spoken businessman is also president of the Port Orford city council. He survived a November recall ballot. Controversy erupted over proposed zoning changes at Battle Rock Park. John says the retail strip that houses his shop will be leveled after the summer of '08 to make way for an upscale restaurant. One of the restaurant's investors is glass artist Chris Hawthorne, who has a studio about ten miles up the Sixes River near Port Orford. John hopes to land a role in the restaurant's operation. Making John part of the team would be a smart move for the new restaurant. John could train employees in the fine art of serving customers. The service workers in the area could sure use it. OK, here's Java John's front yard when the weather is "better." That's Humbug Mountain. It's Probably a Fun Drive at 65 mph. I Wouldn't Know. Impatient tourists fly down this peaceful country road as fast as automotive engineering and driving skill allow. Here is a glimpse of what they miss. Native Curly Horses. 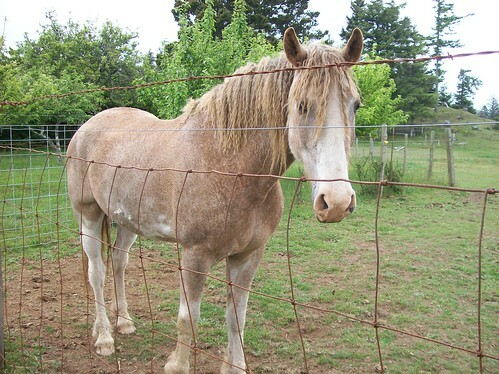 The hypoallergenic breed is a rarity in the horse universe. Sizable cattle and sheep operations flourish in the area. Hughes House-Tours are offered on the same schedule as the Cape Blanco Lighthouse. 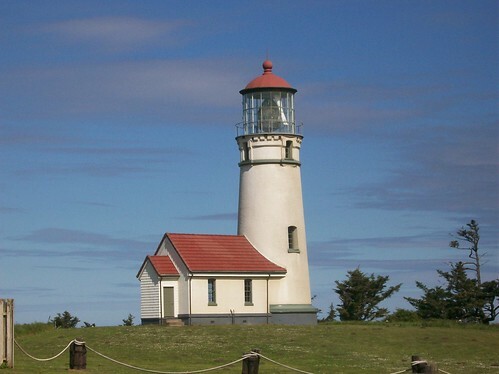 Cape Blanco Lighthouse-Tours 10-3:30 Wednesday-Sunday. Open Holidays. Closed the day after a holiday. You are not allowed to roam the grounds. You can drive out to the tour center. The view from the end of the road. People who drive up typically spend about 30 seconds checking things out, maybe a snap, then they're on their way. Combat Wings dudes get belly laughs while enoying one of the most breathtaking settings imaginable. Enjoy a thrilling dogfight. Yes, they deliberately crash into one another! The new facility is 4 times larger than the former quarters at City Hall. The library opened Independence Day '08. Yes, you can get online here. I'm told that the impressive new library was funded entirely through private donations, including the land. The former facility, more of a reading room than a real library, occupied a cramped space at the Port Orford City Hall. A modest cinder block structure, City Hall housed not only government offices but the police department. It says a lot about Port Orford that they would devote precious space to a library. Thanks to about $24,000 in donated material and labor for renovation, the police department is moving into the vacated library quarters, giving city employees much-needed breathing room. This 7-year-old prodigy was the star of the day. Sometimes an unpretentious event like this can be more fun than an organized big-money affair. 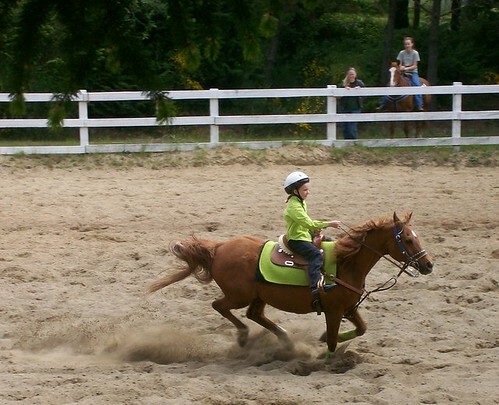 The horsey wingding was held right in town, at Buffington Park. There are easily more animals than humans around these parts. 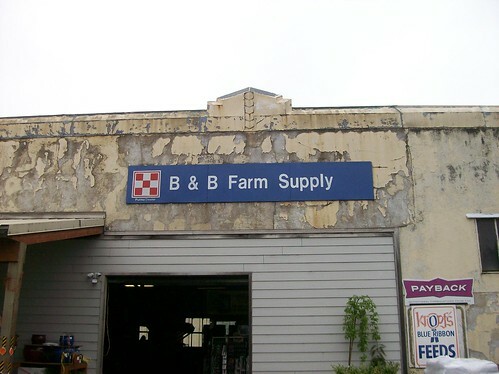 That's where B & B Farm Supply comes in. Find it in the hamlet of Langlois just up the road. This store is about as much fun as you can have in a retail establishment largely due to the proprietor, an adorable country gal. She's a backwoods poet and raconteur. I could listen to her all day. I was too shy to get her name, not wanting to put things on a different footing. I was afraid she might clam up. The store itself is one of those fascinating feedstores you can browse through and marvel at the myriad items and implements farmers need. It's filled with the wonderful aroma of hay and alfalfa. They have a cute cat (17 years old) and a friendly pooch. The store hasn't been there forever. 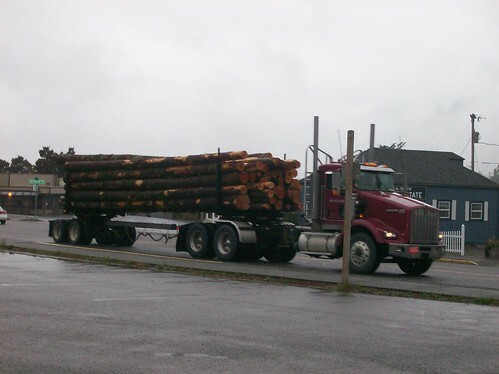 The building used to house a repair shop for logging trucks like this, one of dozens that rumble through town every day. The lady at B & B Farm Supply was kind enough to tell me about this place. The hike in is a flat mile or so. The day we visited, it was absolutely deserted. If you find it, don't breathe a word. Let's keep it to ourselves. Why Are People Allowed to Take Joyrides on These Beautiful Beaches? Sure, Florida has car races on the beach, but that's Florida. Oregon seems so enlightened. 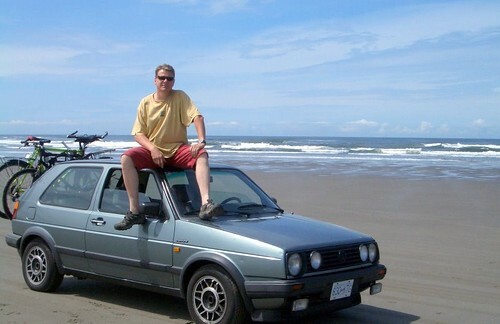 I thought it was really misguided of Oregon to allow people to joyride their cars up and down the beach. That was before I found out about the Beach Bill and how it happened that Oregon's beaches became public. Not some, but all. It's inspiring to think it could happen in the good ol' US of A, so entrenched are the moneyed interests, so willingly do people surrender to the mantra of progress at any price. This is a case where the people won bigtime. Motoring on the beaches is an Oregon tradition dating back to the late 1800s when the motors were horses drawing wagons. In 1913 Governor Oswald West persuaded the legislature to protect all beaches from developers by declaring them a highway. The Beach Bill finally assured the status of Oregon's beaches as public property. With that perspective, I don't worry about cars on beaches. They're a symbol of an amazing victory for people power. Check the progress of the Java John's demolition. The retail strip is on the north side of the parking lot just ahead. It looks like new restaurant/strip mall is well under way. Port Orford Snaps The photos for this post were taken with a simple Kodak snapshot camera. They look far better in full-size format. For example, you can actually see the kayakers on Garrison Lake. Here's the set on Flickr. Hellish Dec. 07 Storm The Wild Wind Cafe & Bakery shown in the video is now defunct. Oregon Dungeness Crab Commission Crab season runs December through August. Grab your pots! The Oregon Dungeness Crab Commission (ODCC) serves the crab production industry, the seafood trade and the general public in a variety of ways. PortOrford.tv Underground television for Oregon's South Coast. Port Orford Lifeboat Station Museum The Port Orford Lifeboat Station (Coast Guard Station #318) was built in 1934 to provide lifesaving service to the southern portion of the Oregon coast. The station went defunct in 1970. 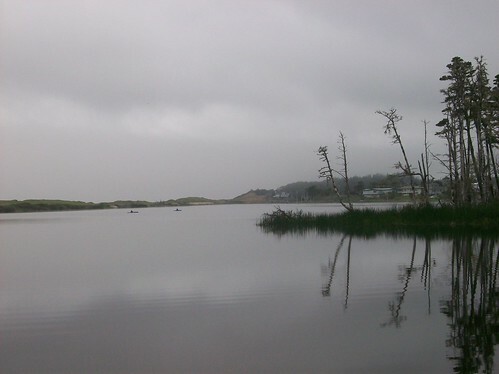 The Southern Oregon coast is a gloom lover's paradise. Check out today's chances of getting a sunburn. Businesses Are Going Belly-up. Who'll be Next? I couldn't believe such a gorgeous woman was serving me coffee at the Paradise Cafe. The encounter ended badly. 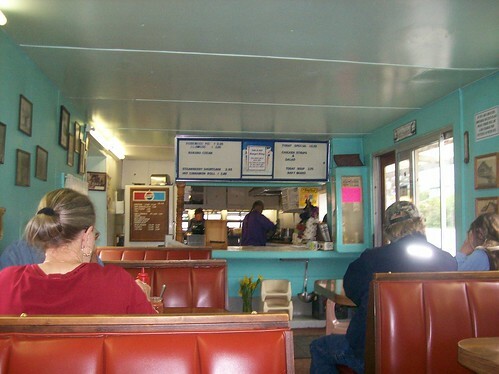 My first stop in Port Orford was breakfast at the Paradise Cafe. The young waitress looked something like the actress Winona Ryder. I imagined her as a recent high school graduate working her first job. That would explain her youthful enthusiasm. I overheard her tell a customer that she was the restaurant's proprietor! I'm a big admirer of entrepreneurs. I wanted to salute her, to congratulate her enterprising spirit. She seemed so approachable, I risked a conversational gambit. "Do you ever watch Chef Ramsay?" She bristled. "I don't watch much TV," she said, her tone suggesting disapproval of TV on moral grounds. I should have dropped it, but I wanted her to know I wasn't a typical TV-watching degenerate. I explained that Chef Ramsay's show had a legitimate educational component. She backed away like I carried the Ebola virus. In hindsight, I guess it was crass of me to mention Chef Ramsay since his specialty is to rescue failing restaurants. I didn't know I'd touched a sore spot. I later found out that two restaurants had only recently gone belly up (as of Memorial Day '08). With the $4 gas slowdown in tourism, who knew where it would end? $5 gas might kill the tourist trade altogether. When I asked Sandee about Jimi, she was quick to respond: "I love him." When I jokingly asked Finch about placing Jimi's works in his gallery, his easy chuckle momentarily deserted him. 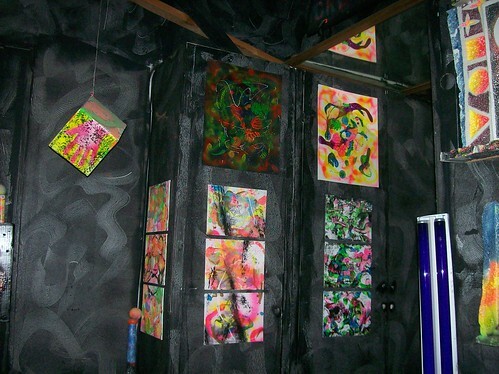 You probably won't quickly forget a visit to the roadside studio of Jimi the Artist. I'm not a connoisseur, so you can't go by my word. I didn't know what to make of the stuff. All I can say is it's something to see. He has an interesting black light room. Looking back on my trip, I still think about the wacky scene and shake my head. Jimi's quite the guy. Why he isn't famous like Jackson Pollack is beyond me. 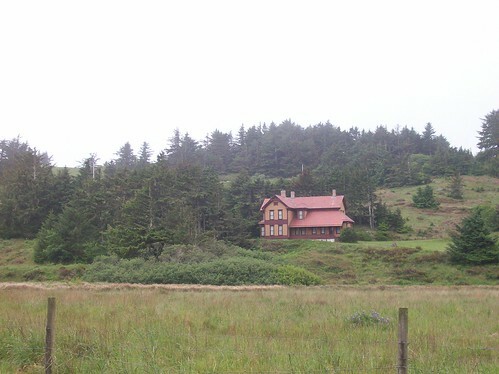 To find Jimi's studio, you have to go way up the road almost to Bandon. It's on the right, not far past the wildlife safari. Who can pass it by? As soon as I saw it, I had to stop in. On our second visit, some next generation bikers came in. They looked to be 30ish, clean cut, wholesome. They drove those quiet motorcycles that sort of purr. I guess a real biker would say these kids were wusses. They said they were from Montana. One of them said, "You can't go by a place like this. 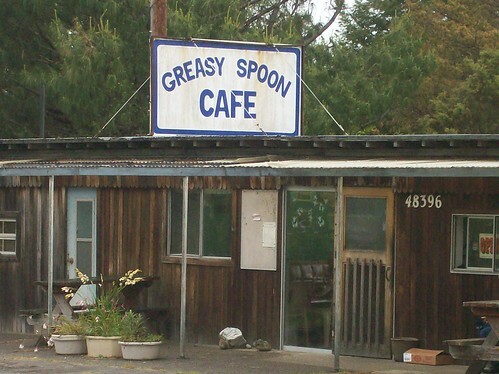 You see the sign 'Greasy Spoon' and you have to stop in." Exactly. First things first: Don't bother with the coffee. What they serve is scarcely recognizable as coffee. Make other arrangements. Otherwise you can get a good breakfast here. They have mouth waterin' thick bacon. But it's really more about the experience, watching the locals wander in to catch up on gossip and so on. People love to come here. The day I snapped this picture there was a nice little rainstorm going on. "Liquid sunshine" they call it around these parts, as in "I hope you are enjoying our liquid sunshine." When I clicked the shutter, someone said "I thought I saw a flash." "I didn't hear any thunder," someone replied. I kept quiet. Heh heh heh. The Greasy Spoon Cafe is on the way to Bandon, right next door to B & B Farm Supply. A few steps down from B & B is the Langlois Market, known for world-class hotdogs. Finch is a burly biker who looks like he could crush your head like a grape. He has a soothing James Earl Jones voice. When I suggested a sideline in voice-overs and narration, he responded with the easy chuckle of someone who has the world by the cojones. He owns Port Orford's only liquor store, a monopoly guaranteed by Oregon's archaic Liquor Control Commission. The only gripe I heard from Finch is his need to tend the store for 8 or 9 hours a day, six days a week (summer hours are 10-7). I assume Finch isn't comfortable trusting his business to an employee, which is understandable. Finch graciously gave me a tour of his operation, including the his-n-hers Harleys parked in a corner of his custom jewelry emporium. The small gallery features paintings by his mother Patricia. He has an extensive workshop behind display cases that hold his jewelry collection. Finch's works would appeal to a broad spectrum of jewelry fanciers, especially bikers. The Finch you meet at his store/gallery is just one side of this multifaceted hombre. One of the town's leading citizens, he's been a member of the city council since 2004. 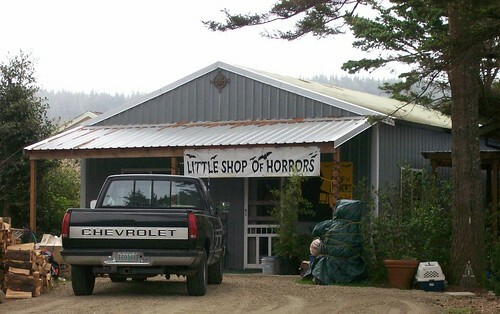 There's nothing at all horrifying about this little shop. It occupies an obscure location down a side street and probably doesn't get much tourist trade. It's like wandering into what was called a "variety store" back in the day. The proprietor is another adorable gal, retired nurse Sandee Luhr. When I visited, she was trying to come to terms with being ripped off to the tune of $200 by local shoplifters. She obviously isn't in it for the money but to share her fascination for kitschy merchandise. So you have to wonder: Why? How could they do this to such a kindly person? 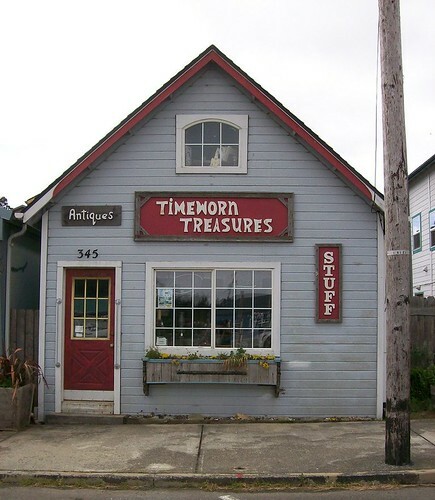 Port Orford has scads of cute galleries and trinket shops. Your intrepid explorers were so enthralled with outdoor beauty that we neglected them. Did I mention we enjoyed the glorious gloomy weather? We reveled in every minute of the rain, fog, the chill winds and the mist. A lot of people make travel a TiVO experience. Fast-forward through the boring parts. What's boring about travel? Well, just about everything when you're fixated on the next stop and where you have to be by day's end. Some lay out a strict itinerary, dividing the day into increments that are judiciously alloted to each point of interest. It's sightseeing, not traveling. Not that there's anything wrong with sightseeing. You're less receptive to distractions that make travel rewarding, however. You're less likely to hang around for an epic dogfight put on by combat wings dudes. Not on the itinerary. Skip it. 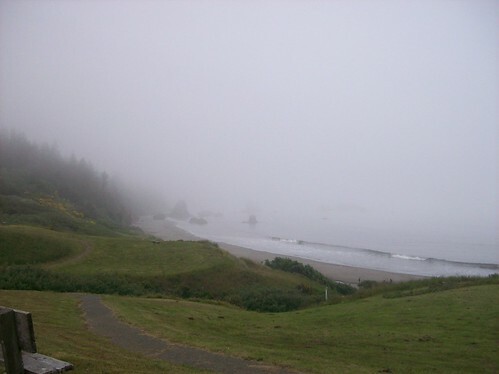 Port Orford doesn't offer much for sightseers because you have to slow down and pay attention. A lot of what's worth seeing isn't prominently displayed. You have to head down side roads. When people find out you have to travel five miles down a country road to get to Cape Blanco, the TiVO mentality kicks in. Step on the gas! Let's get this over with. Driving a nearby country road I had an old codger give me the finger wave. It's not the act of hostility you might be thinking of. The finger wave is an old-fashioned backcountry greeting used by good ol' boys and gals. It's an understated wave: it just says hey bud, not HELLO IT'S ME! I'M WAVING! 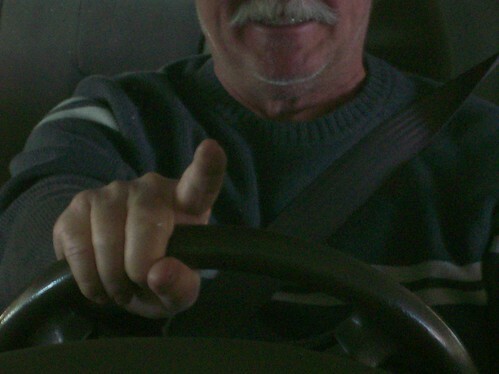 As your right hand grips the steering wheel, you signal the passing motorist by lifting your index finger. The other driver may or may not notice. Feelings aren't ruffled if the other person doesn't respond. The classic backcountry steering wheel grip was to drape an arm over the steering wheel, resting your wrist on the wheel around the 12 o'clock position. Your free hand might be holding a smoke or a beverage, you might hang your left arm out the window, or put your right arm around your baby. The finger wave probably sprang from this style of steering. You acknowledge the other driver without removing your hand from the wheel. Safety concerns might be a factor in the origins of the finger wave. But it's also the perfect understated masculine greeting, similar to the almost imperceptible nod men use to acknowledge each other. Today's race car steering wheels make the classic arm-drape impractical, but the finger wave survives on the backroads of America. 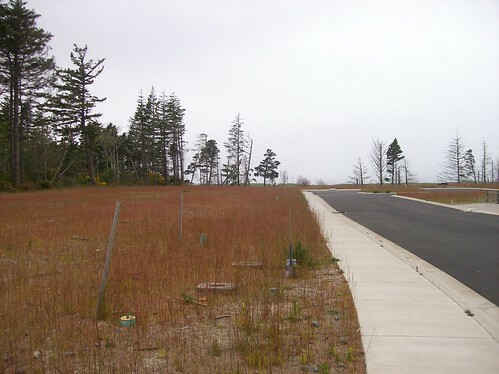 No signals and a 30 mph speed limit are symbols of the identity crisis Port Orford faces. Someday there will be traffic lights. There will be pressure to raise the speed limit to keep up with the times. It's a place that would like to be left alone to go about its business without intrusion from pesky outsiders. Yet, outsiders are desperately needed for the region's survival. Outsiders are needed to bring Port Orford into the 21st Century. 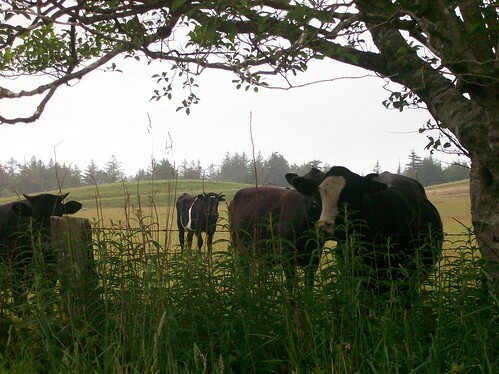 When you first arrive in Port Orford, people may openly gape at you. You are as likely to be greeted with a sneer as with a smile. While I waited for the public library to open, a city employee came out of the attached government complex and gave me a scowl of contempt. It wasn't the only such look I got from a local. The area's friendliness overpowers the suspicion of outsiders, however. A visit to Java John's settles any question about it. You're struck by how easygoing and good-natured people are. Even the grouches don't seem stressed. It's more like misanthropic self-absorption. As I said, Port Orford is a town with multiple personalities. There are wealthy transplants from California who cashed in on the real estate bubble. Their showy homes dot the surrounding hillsides. It remains to be seen how many can withstand the challenging winters with icy winds reaching 120 miles per hour. There are displaced lumber and fishing workers who inhabit the lowlands. There are service workers who live in trailer parks. 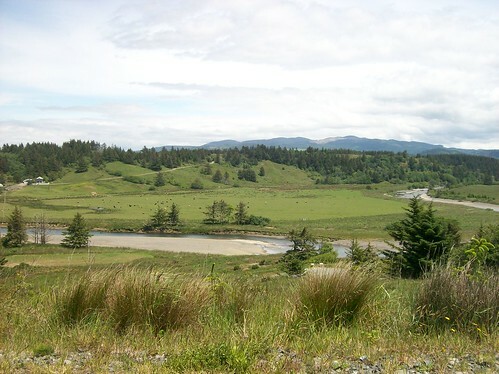 There are sizable cattle and sheep ranches. Surrounding Garrison Lake are fashionable lakefront properties mixed with tumbledown shanties, their yards piled high with junk. There are artists, writers, and online entrepreneurs. At first it's shocking how different people look here. There are a lot of gray-haired people with deathly white skin. It's what the world looked like before hair coloring was invented. Signs of diversity are virtually nonexistent. A fair number of the men have braided pony tails. Older folks appear to outnumber youngsters by a considerable margin. The 2008 graduating class of Pacific High School numbered 33. 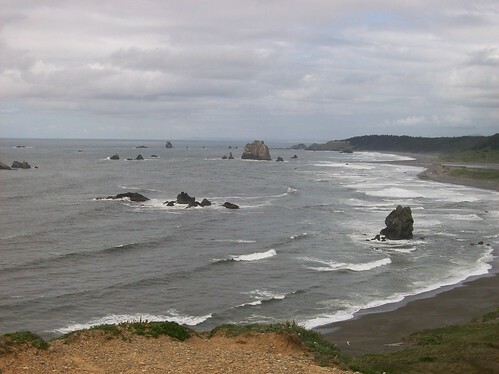 There are feelings of inferiority to Bandon, Port Orford's neighbor to the north. Bandon has the Bandon Dunes golf course, one of the world's premier golfing venues. Who would have thought a world-class golf course would work on the southern Oregon coast? 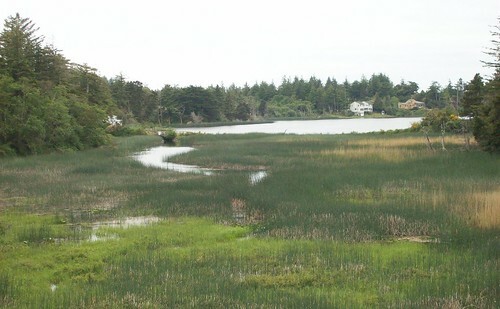 A crackpot idea when it was conceived, Bandon Dunes has turned Bandon into a glamorous, upscale version of Port Orford. A world-class golf course--why didn't Port Orford think of it? What can Port Orford do to match it? Why not a megaresort on Blacklock Point? The idea is sure to be seriously considered at some point. Yes, Bandon is too big and too touristy. It has ugly condo complexes on the beach. It has heavy traffic and lots of signals. But it has jobs and thriving businesses. Port Orford has an unselfconscious charm similar to Cannery Row in the '60s before theme-restaurant-style charm was grafted onto its decaying carcass. Port Orford faces the same choice. Charm that evolved over generations versus instant "charm" concocted by consultants and designers. A thriving tourist center or a backwater limping along on ailing fisheries and lumber mills. When I suggested to Java John that maybe Port Orford could strike a balance, he cut me off before I could finish: "People have to make a living," he said in a stern tone. He strikes me as one who usually observes conversational niceties. It shows how strong feelings are about the state of commerce in Port Orford. 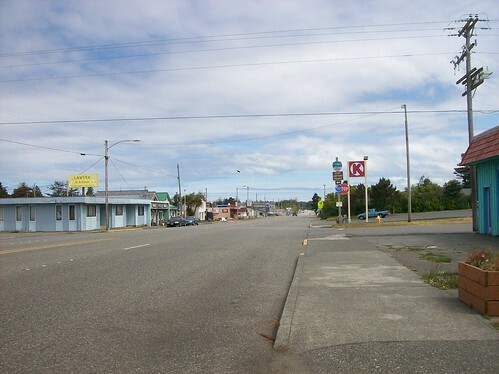 Hwy 101, the main drag through town, is pocked with vacant storefronts. Some dilapidated businesses, such as the Port Orford Inn, are prime candidates for demolition. In a world that cherishes growth for the sake of growth, a town that hasn't grown at all since the 1960s is a tragic failure. Something must be done. One thought being considered is to develop a shopping district similar to Old Town Bandon, with its cute shops and "sense of arrival." The plan is detailed in a 2006 consultant's report. It doesn't mention Bandon, but it's not hard to guess the inspiration for Port Orford's hoped-for "quaint, pedestrian-friendly shopping destination" (p.51). 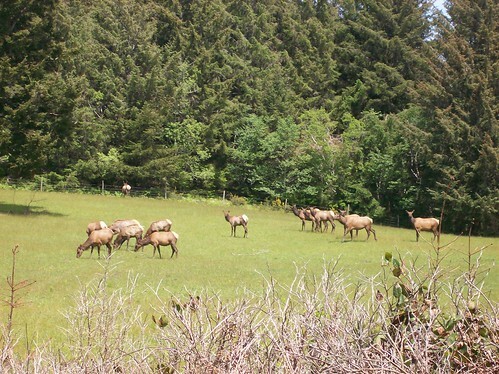 Locals feel that Port Orford, in contrast to Bandon, is too spread out and poorly organized to nurture tourism. That's part of the charm. Port Orford needs to forget Bandon. It will never be another Bandon. Imagine this beauty rolling up and down the main drag, delivering customers to shops and eateries. 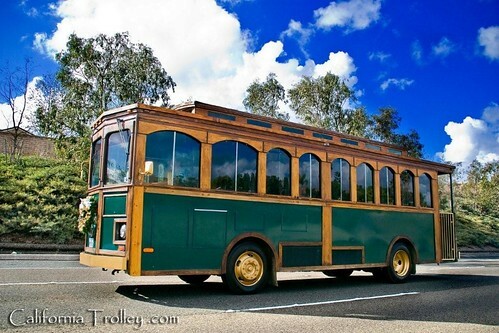 City fathers should consider free open-air trolleys similar to what Laguna Beach, California does during the summer. The trolley is fun! There's camaraderie among passengers that you don't get in a quaint shopping district like Bandon has. The outlook can only get better. Baby boomers will likely revitalize the town. The only concern is that they'll be too much of a good thing. Not all of the 60-something million 60-somethings will seek a sunbelt retirement. Some of these old farts will be drawn to a place of unmatched beauty to spend their "golden" years. In Oregon they'll be called the "rust" years. Oregon has stretches of farmland ripe for conversion to vast housing tracts, freeways, shopping centers, and business complexes. Anyone who thinks it can't happen need only look at the horror show that Medford has become. Retirement communities don't need proximity to a large city. Builder Pulte's Del Webb division has started a major retirement mecca outside the Nevada town of Mesquite, little more than a settlement in the desert 80 miles from Vegas. 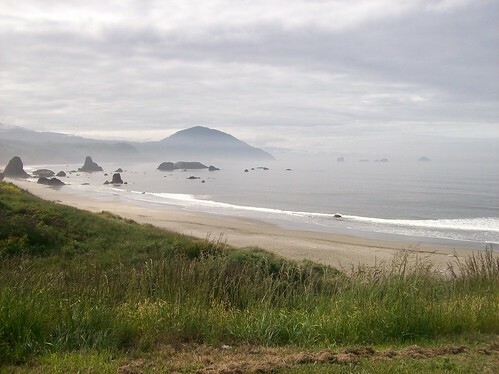 Port Orford is close enough to Coos Bay to make a retirement community feasible. Just because you can do something doesn't mean you should. The world is full of ruined places that demonstrate this. Wonderful descriptive writing. I love Oregon. My parents once lived in Brookings but I have never even heard of Port Orford. Definitely need to take a road trip! When I wrote this item back in '08, the coop market didn't exist. It's good to know innovation continues. Thanks for reading! I stopped here on a trip down the coast. I remember watching whales right off the beach; a once in a lifetime sight. I've been all over the country but I'll never forget my day at Port Orford. Happy to read not much if anything has changed in Port Orford, I went from 3rd grade through high school in this little town in the 60's. I worked every summer at a little restaurant called The Galley,for the grand sum of $1.00 an hour plus tips. It was just me and the cook,so on a really good day in the summertime I could take home $20.00. Took orders,cleaned tables,did ALL the dishes too. Oh the good old days! I have walked from one end of this little city to the other so many times,and soent hundreds if hours on the beach,climbing Battle Rock,I'll bet my initials are still carved in a stump up on the top. It was not unusual for a girlfriend and myself to walk to the cannery where they would give us the bottom of a coffee can filled with fresh shook crab for the grand sum of $1.00 to take on our beachcombing walk. This coming summer I plan to come down from Seattle and spend a night or two! Can't wait!